Home › Pix of the Trade › On Track With Barbados! It was a night of racing, good food, rum punch and all things Barbados last night (Oct. 4) as Barbados Tourism Marketing Inc. (BTMI) hosted the trade at Woodbine Race Track in Toronto. Peter Mayers, director of Canada for the BTMI, thanked their Canadian partners for their support, noting that visitation numbers from Canada are up 12% as of the end of August. He also noted that Barbados, located in the south-east corridor of the Caribbean, was “unscathed” from hurricanes Irma and Maria. “One thing this has taught us is that there is a need for a geography lesson,” said Mayers. 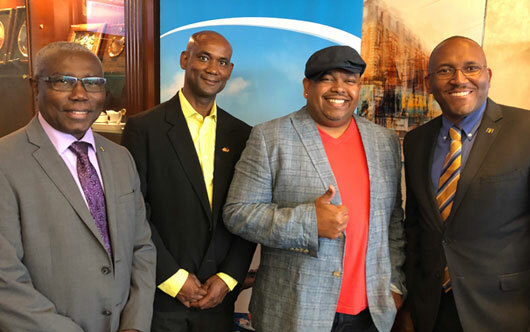 “We have to get the word out that most of the Caribbean is open for business.” Pictured at the Toronto event, which also featured Barbadian jockey Patrick Husbands in several races, are (l-r) Haynesley Benn, Consul General, Adrian Goddard of the Consulate of Barbados, Chef Chris De La Rosa and Mayers.